My two favorite Girl Scout Cookies are Samaos (Caramel deLites in some regions) and Thin Mints. I could eat them both by the box, in a sitting, and as a kid I did. Sure wish I still had that metabolism. I think you guys love Samoas too because this Samoas Cookie Pie video has been viewed by 8 million people on Facebook! But I digress. For me to say a cookie bar that resembles Samaos but is better than Samoas is a huge statement. But these are better than Samaos. And so much easier than making individual cookies. No mixer required. 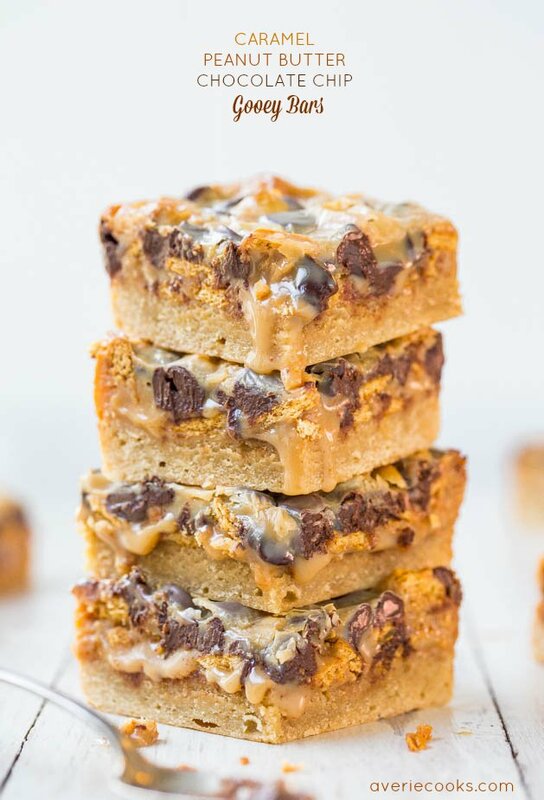 They have an Oreo crust (trumps a shortbread crust), are topped with coconut, chocolate chips, and are drenched in salted caramel. They’re very chewy, rich, and decadent. Even though one is plenty, I couldn’t stop at just one. Just like real Samaos. 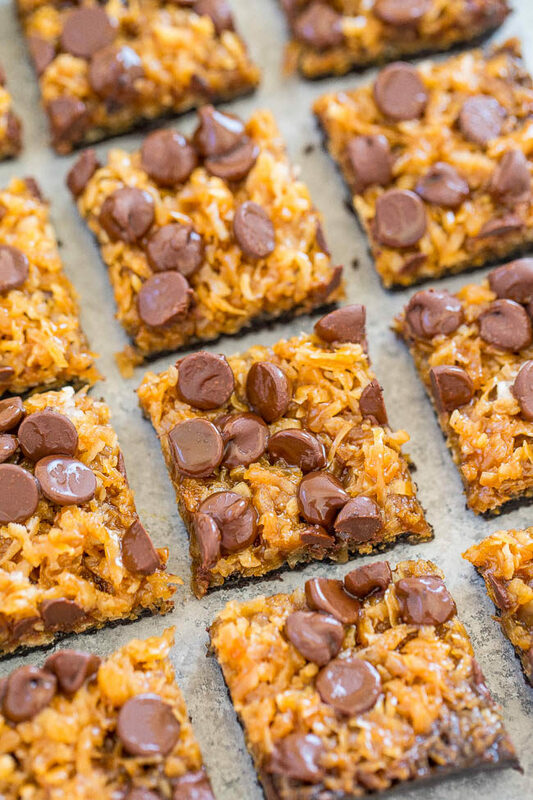 There’s a secret ingredient included: corn flakes. Why? 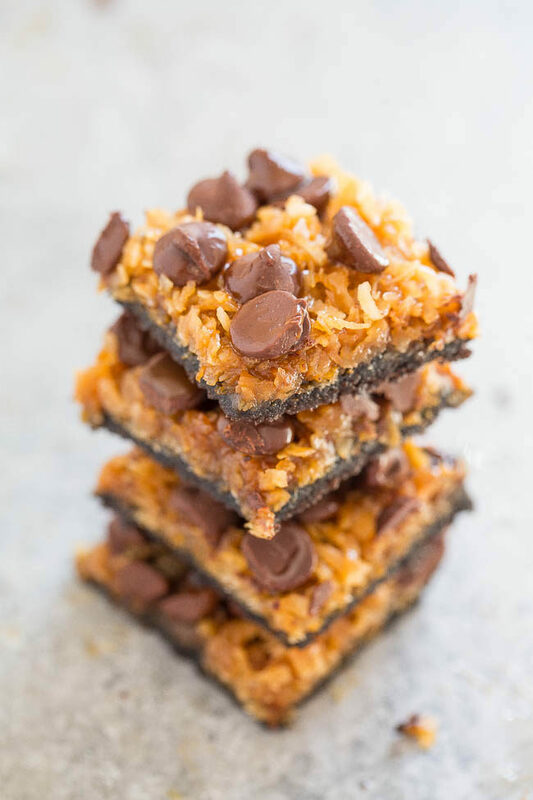 Because between the Oreo crumbs mixed with butter, the oil from the coconut, and all the salted caramel, the corn flakes help absorb the liquid so the bars stay intact. You can’t taste the corn flakes and if you don’t have corn flakes on hand, Rice Krispies, Special K, or a similar cereal would likely be fine although I haven’t personally tried those options. I used Trader Joe’s salted caramel but you’re welcome to use another brand or make your own. Don’t use ice cream sundae caramel sauce because it’s too thin and runny. When you take the bars out of the oven they’ll be bubbling vigorously. Allow at least 1 hour for them to cool and set up, longer if you can stand it, before you sink your teeth into all the gooey layers, textures, and flavors. These are better than Samaos, easier than making individual cookies, and no mixer required. 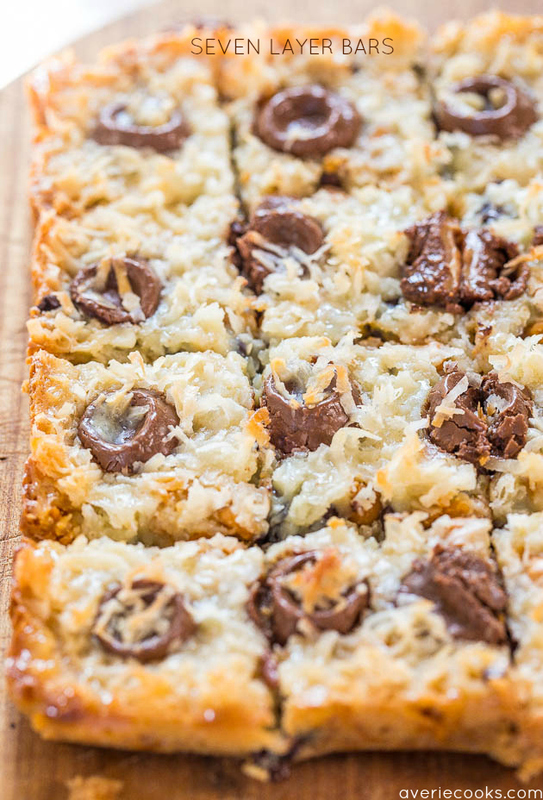 They have an Oreo crust topped with coconut, chocolate chips, and are drenched in salted caramel. They’re very chewy, rich, and decadent. Corn flakes help absorb the liquid so the bars stay intact but you can’t taste them. I used Trader Joe’s salted caramel but you can use another brand or make your own. Don’t use ice cream sundae caramel sauce. When you take the easy bars out of the oven they’ll be bubbling vigorously. Allow at least 1 hour for them to cool and set up, longer if possible before you sink your teeth into all the gooey layers, textures, and flavors. Preheat oven to 350F. Line an 8-by-8-inch baking pan with Reynolds Wrap® Non-Stick Aluminum Foil, spray with cooking spray (I highly urge you to use foil for easier removal from the pan and easier cleanup); set aside. To the canister of a food processor, add the Oreos and process at high speed until you have fine crumbs. Stop the machine and add the melted butter. Process at high speed to incorporate. Turn crumb mixture out into prepared fan and firmly pack the crumbs into an even flat layer with a spatula. 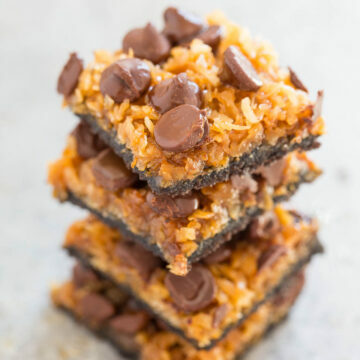 Evenly sprinkle the corn flakes (I simply crush them 1/2 cup at a time in my fist), coconut, chocolate chips, and evenly drizzle with salted caramel. Bake for about 22 to 25 minutes, or until caramel is bubbling vigorously around the edges of pan and in the center. Allow pan to cool on a wire rack for at least one hour (longer if you can wait). Optionally sprinkle with sea salt before serving. Bars will keep airtight at room temp for up to 1 week or in the freezer for up to 4 months. 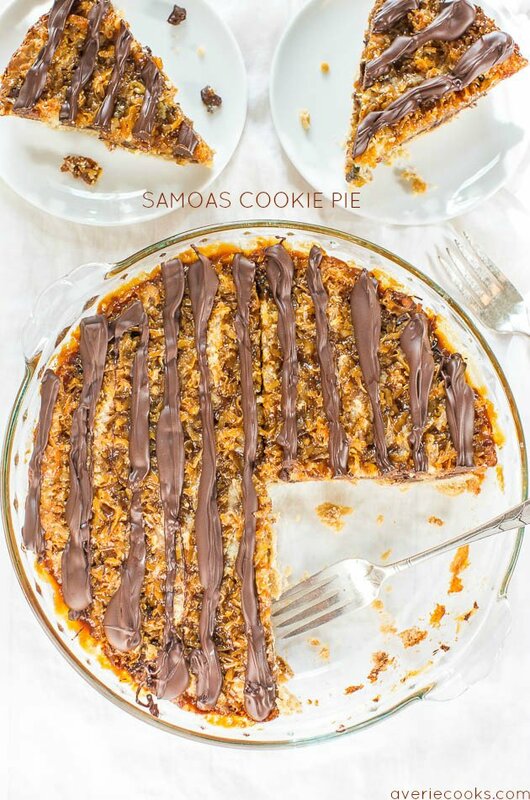 Samoas Cookie Pie – Move over Girl Scout Cookies! The flavor in this easy, giant cookie is 100% spot-on! Hello year-round cookie season! 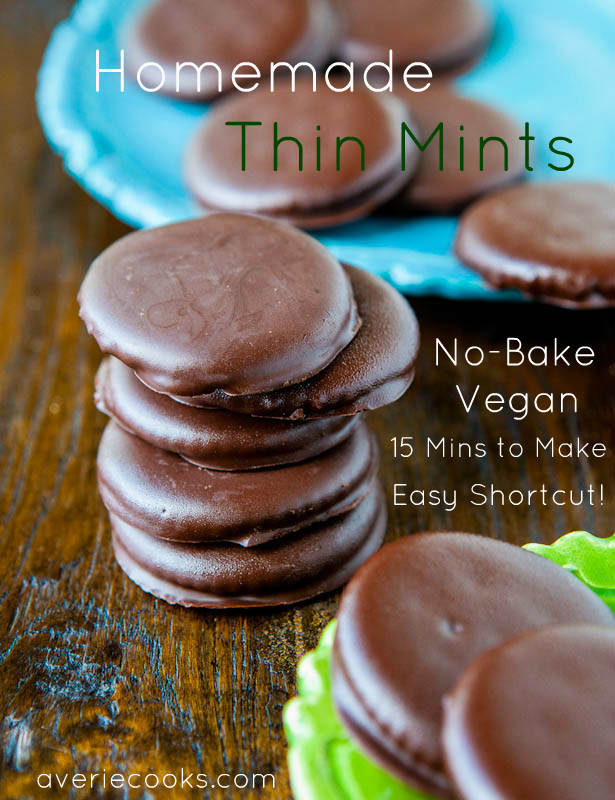 Homemade Thin Mints – (no-bake, vegan) – Only 3 ingredients in this spot on copycat version of real Thin Mints! Easy recipe! 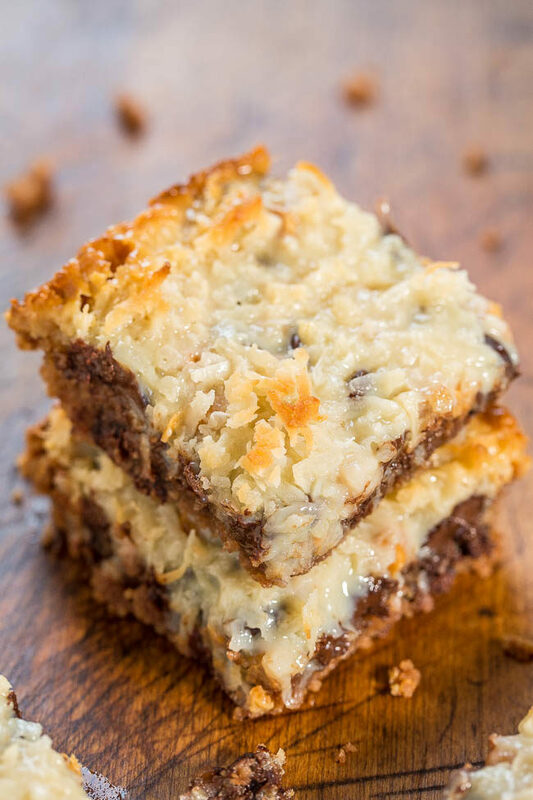 Magic Eight Bars – The classic, made with an extra layer and so darn good! 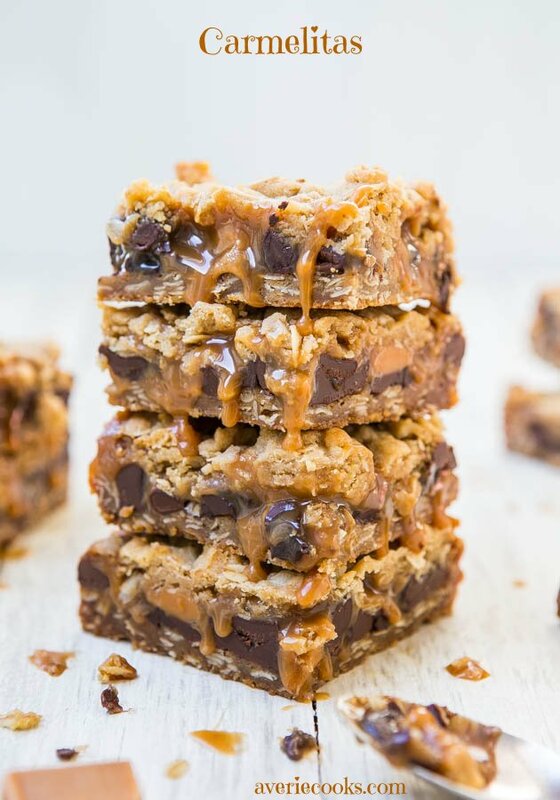 I haven’t had a samoa in ages but these look awesome and homemade is always better. They remind me of a magic bar with all the layered ingredients. Total YUM!! 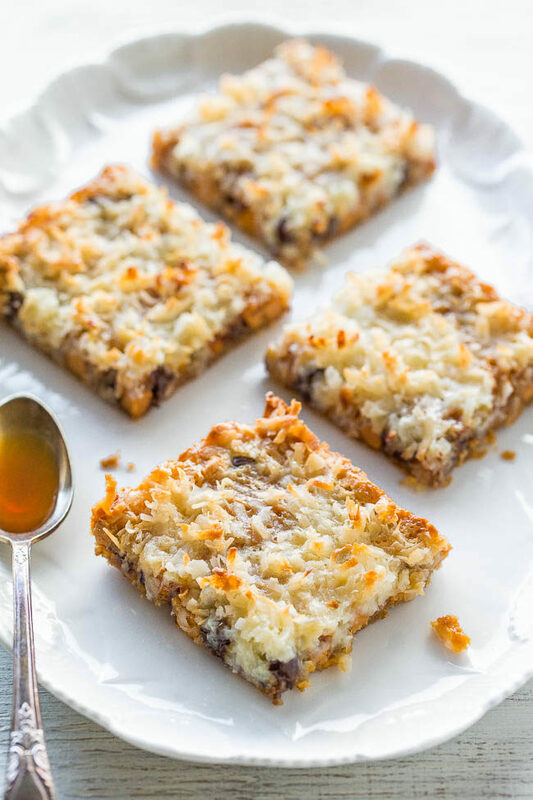 It’s a cross between a magic and a Samoas and I started the recipe in my mind trying to create more of a magic bar but after I tasted it, I re-titled the recipe to Samaos because that flavor/texture profile just really shines through. I LOVED these! Those are also my favorite Girl Scout cookies! 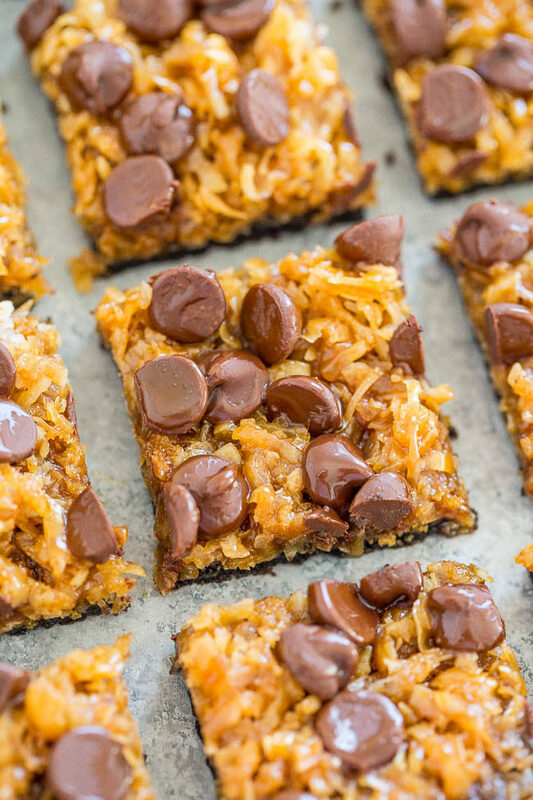 Now that my son has braces, I’ve been trying to avoid “sticky” cookies, but this recipe has me salivating …. Well too bad for your son that he may not be able to eat these but you have to make them! One of my fave desserts of the year! Absolutely fabulous! I’d eat a dozen, can’t wait to try them. They were one of my fave desserts all year! Seriously I loved these things! Holy cow. 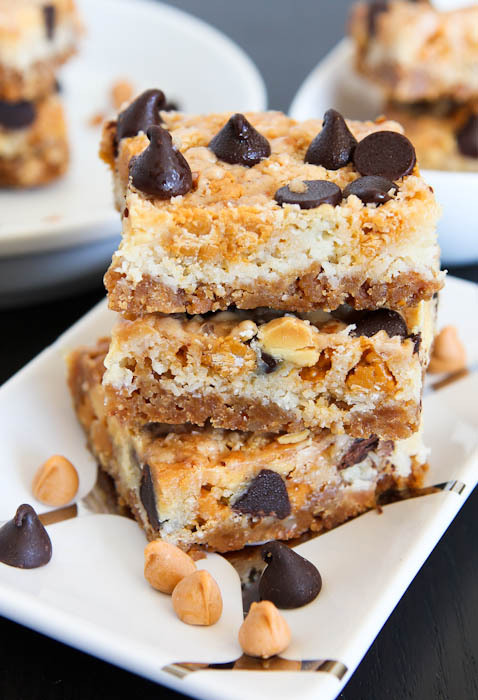 I want to make and eat these PLUS all of the other recipes listed after them! 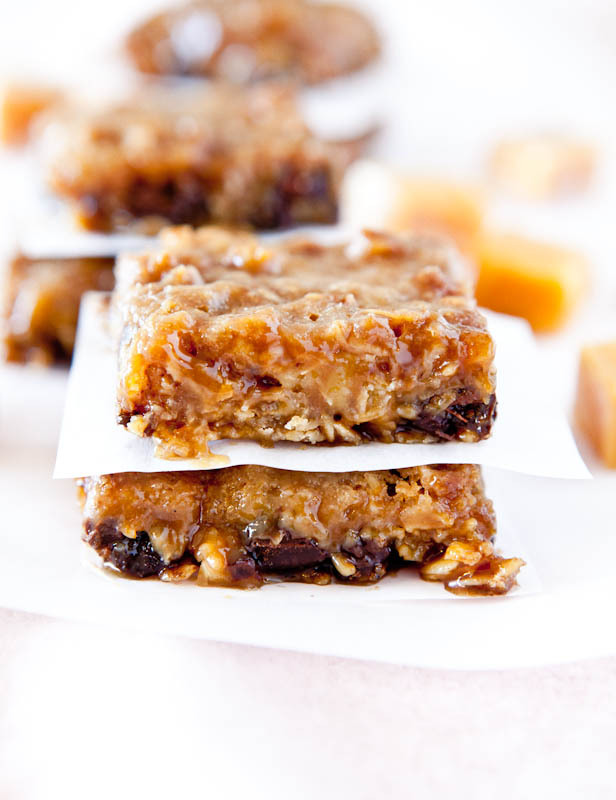 You really know how to nail it in terms of ooey-gooey-sticky-yummy goodness! Thank you! These are amazing! I doubled the recipe and baked it in a 9×13 pan to bring to church. Super easy to make and they smelled incredible while they were baking. The hardest part was waiting for them to cool enough to eat ?. Thanks for the awesome recipe! Thanks for trying the recipe and I’m glad it came out great for you! Glad it was a big hit! oooooh even BETTER than samoas? I’m intrigued! Honestly…YES! Better than. I loved these. One of my fave desserts of the year for sure! OMG I can’t wait to make these with gluten free oreos! These look phenomenal! These squares are certainly delicious. Unfortunately they deconstructed before they could reach anyone’s mouth. Any suggestions on getting the coconut to adhere to the base? Glad they tasted great! I didn’t have any issues with adhering; as in they were like superglued together. But I would suggest using more caramel sauce (and make sure it’s nice and thick; not a thin ice cream sundae sauce) and/or baking slightly longer. 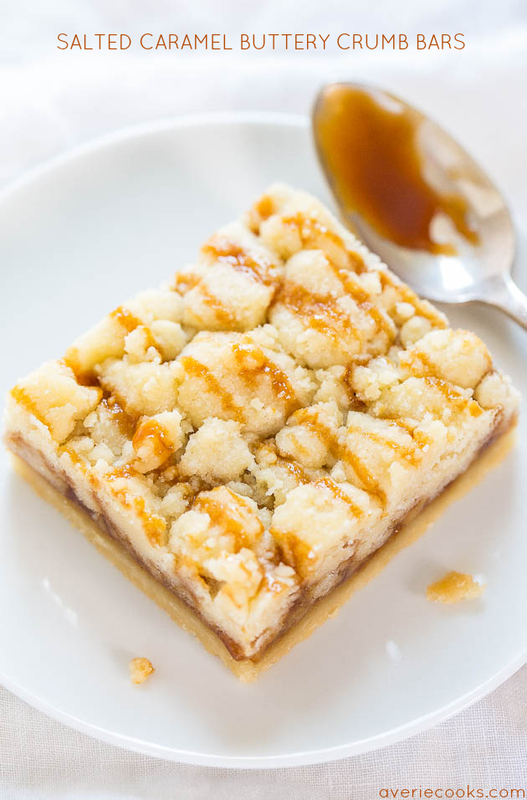 I use Trader Joe’s salted caramel and it’s very thick and perfect for the bars. Keep in. Don’t need to scrape out. I am all about minimal effort!